After three years of a relatively stable carbon emission globally, it is now estimated to rise by about 2 per cent by the end of 2017. In 2016, global carbon dioxide (CO2) emission from fossil fuels and industry was 36.2 ± 2 gigatonnes (Gt), which was 62 per cent more than the 1990 mark. The projection for 2017 is 36.8 ± 2 Gt. 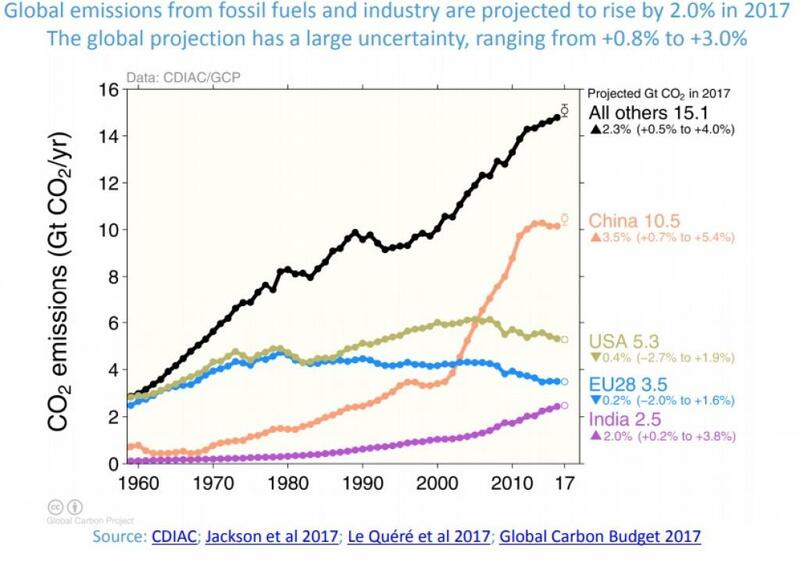 Global CO2 emissions from all human activities (fossil fuels, industry and land-use change) will reach around 41Gt in 2017. This has been claimed by the 2017 Global Carbon Budget published by the Global Carbon Project (GCP)—an umbrella group of 76 scientists from 57 research institutions in 15 countries. The report comes at an opportune time when the signatories to the Paris Agreement have gathered at Bonn Climate Change Conference and discussions are taking place on climate adaptation, financing and loss and damage, as enshrined in the climate pact. “Time is running out on our ability to keep warming well below 2°C let alone 1.5°C,” says lead researcher Corinne Le Quéré, who is also the director of the Tyndall Centre for Climate Change Research at the University of East Anglia. “This year we have seen how climate change can amplify the impacts of hurricanes with stronger downpours of rain, higher sea levels and warmer ocean conditions favouring more powerful storms. This is a window into the future. We need to reach a peak in global emissions in the next few years and drive emissions down rapidly afterwards to address climate change and limit its impacts,” he adds. Who all are increasing their carbon footprints? China’s emissions are projected to rise 3.5 per cent in 2017. 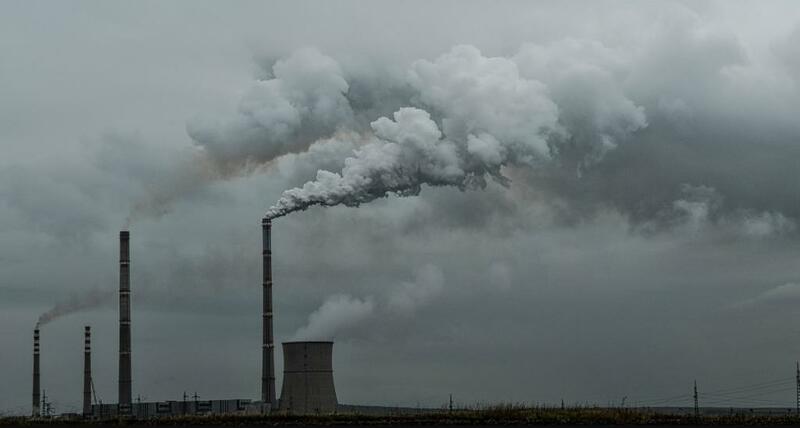 “The use of coal, the main fuel source in China, may rise by 3 per cent due to stronger growth in industrial production and lower hydro-power generation due to less rainfall,” says Glen Peters, co-author of this report and research director at CICERO in Oslo. While India’s emissions are projected to grow by 2 per cent in 2017, it will be less than the average increase of 6 per cent over the last decade. This, according to the Global Carbon Budget, is due to significant government interventions in the economy. Emissions from the rest of the countries—representing about 40 per cent of the global CO2 emission, are expected to increase around 2.3 per cent in 2017. “This year’s carbon budget news is a step back for humankind. We must reverse this trend and start to accelerate toward a safe and prosperous world for all. This means prioritising providing access to clean, reliable energy to the hundreds of millions of people across the world without access to what many of us take for granted every day—electricity. Fortunately, now it is not only possible, but in most cases makes simple financial sense, to meet these electricity needs with renewable energy sources,” says Amy Luers, executive director of Future Earth, one of the sponsors of the Global Carbon Project (GCP). In 2017, the emissions from the US and the European countries are projected to decrease by 0.4 per cent and 0.2 per cent respectively. However, this year’s decline rate is lower than the average of 1.2 per cent for the US and 2.2 per cent for the European nations. The report claimed that in the last decade (2007-2016), emissions in 22 countries (representing 20 per cent of global emissions) decreased even though their economies grew. Technologies like wind and solar power, according to the report, have expanded by about 14 per cent annually in recent years. According to Robert Jackson, co-author of the report and co-chair of the Global Carbon Project, transition from fossil fuel burning to renewable energy will continue in the US even as the Trump administration rolls back policies aimed at reducing country’s greenhouse gas emissions. “Transition is being driven by the low cost of new renewable infrastructure, and it’s being driven by new consumer preferences,” Jackson adds. However, uncertainties over scientists’ ability to estimate recent changes in emissions exist. “The Global Stocktake under the Paris Agreement will occur every five years, and this puts immense pressure on the scientific community to develop methods and perform measurements that can truly verify changes in emissions within this five-yearly cycle,” says Le Quéré.